If you are new to fly fishing, I offer beginner classes with equipment provided by Orvis that will put you on the right track. Or maybe you need to learn where to find the wary trout that are found in our spring creeks. For this, I offer year round guiding on the Falling Springs, LeTort, and Yellow Breeches, as well as some other excellent South Central PA streams, and will show you how and where to find these trout and techniques and flies used to catch these wild trout. I also offer destination trips to the Juniata River where we will fish the Catch and Release All Tackle Trout Water. Or join me on Spring Creek, a fine Central, PA no-kill trout stream. At the end you walk away with your own Orvis Clearwater 864 Mid 6.0 a 8'6" 4 weight outfit or the 7'9" Clearwater 5wt outfit! It all depends on what you want. I can say the 7'9" cast a great 4wt line. That is why I have added it!!! The day will begin with casting lessons and some knot tying. Next we hit the stream to teach essential fly fishing techniques used to fool trout. From there, I'll show where you can find trout, feeding lies, simple ways to ID insects, what patterns to use and so much more. Classes are eight hours long which includes meal, flies and plenty of fun. A deposit of $175.00 is needed and is not refundable. Invite a friend or two to enjoy the day. 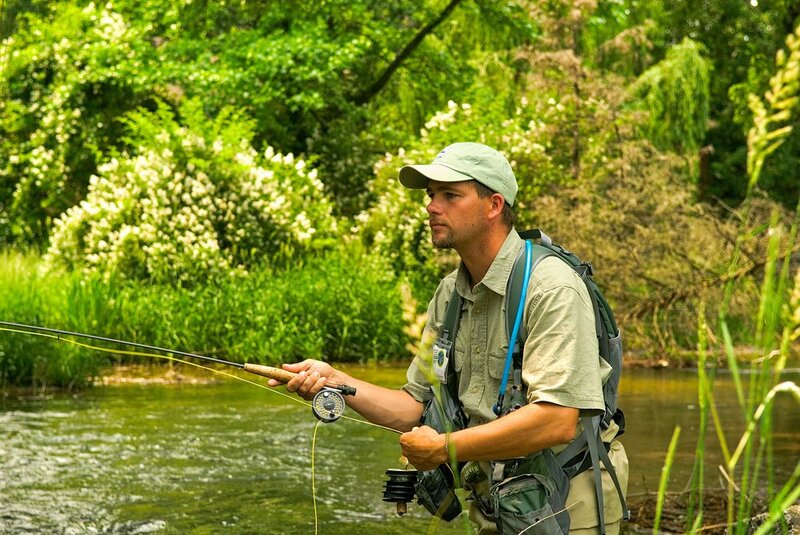 An eight hour stream guide includes: meal, flies, rod and reel if needed; instruction in casting, stream information, fishing techniques, and more. With groups it is best that you know the fly fishing basics, and I will work with the least experienced! A four hour day includes small meal, flies, rod and reel. The half day is more suited for the educated angler who wants to improve on or learn new stream techniques. Group trips from four to 8 people are also available for any fishing trip! Contact me for details and prices. I have enjoyed fishing over some great early season hatches on this fine Central, PA no-kill trout stream. The season gets kicked-off with some early season blue winged olives then green caddis, to sulphurs, tricos, terrestrials and midges. Spring Creek is best known for "Fisherman' Paradise" the public no-wading access along the hatchery, but has some great water outside this section of stream. These are wade trips only. Trip includes transportation from Chambersburg to river, flies, great riverside lunch and fly rods if needed. Learn how to get there, best areas to fish, insects and fly patterns to match. Trips to this outstanding fishery available from April to October.